To win in the salary cap era, a team needs top-to-bottom production. First line forwards need to perform like elite scorers while third pairing defensemen need to provide steady minutes. This year’s trade deadline reflected this, as contenders parted with valuable assets to add depth players. To consistently win and compete for the Stanley Cup, teams cannot rely exclusively on the highest paid players. While getting production from these players is important, teams must also get value from players on Entry Level Contracts (ELC’s) and bridge deals. The Pittsburgh Penguins are a recent example. 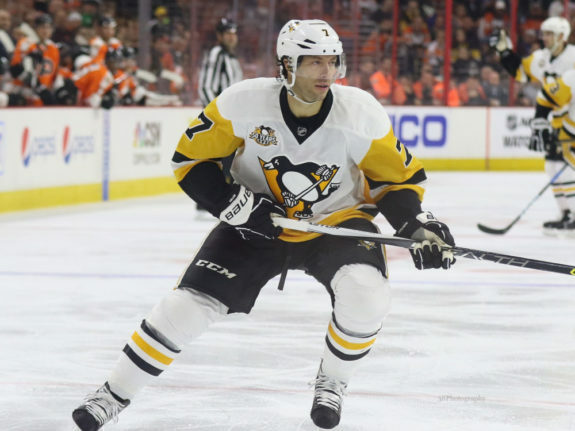 They have a core of talent, with Sidney Crosby and Evgeni Malkin among others, who have signed a long-term contract and all are part of the team’s future. The Pens’ front office supplements this core by getting production out of players on cheaper contracts, like Jake Guentzel who is on an ELC. He had 16 goals and 33 points in 40 games last season and led the playoffs with 13 goals. In order to be successful, a team’s front office must identify a core and be willing to pay those players, part with those not in the core, and recognize young players with upside. These teams also need veterans willing to play on cheaper contracts, like Matt Cullen for the Penguins last season. His contract had a $1 million cap hit and he contributed nine points in the playoffs while playing a key fourth line role. Both Cullen and Pittsburgh’s young players had one thing in common: their value outweighed their contracts. Jake Guentzel earned less than $20,000 per point last season while Cullen earned $28,324 for his production. Using a cost-per-point (CPP) measurement is a straightforward way to determine a player’s value to his team and the value a team is getting from its roster. Similar to calculating a player’s CPP by dividing a player’s cap hit by his points, a team’s CPP is measured by dividing their cap hit by the roster’s point total. 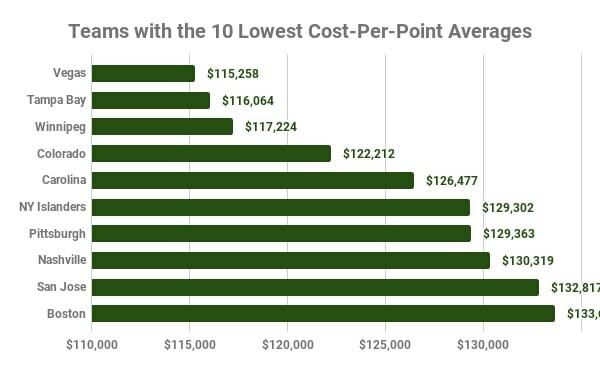 For the league, the average cost of a point is $140,798 this season. Teams spending above that mark aren’t getting good value while those spending less are cost-effective teams. The two teams with the best value for production are, not surprisingly, the Vegas Golden Knights and Tampa Bay Lightning. The Lightning lead the league in points while the Golden Knights are second in the Western Conference and lead their division. Quality teams have to get production from all areas of their roster like the Penguins have the past two seasons but they also have to limit the number of bad contracts given to players. The Golden Knights are interesting because their roster is full of castoffs. These include players on ELCs or bridge deals as well as contracts in the $5 million range. Regardless of salary, nearly all players apart from those buried in the minors or on Long-Term Injured Reserve have given the team a high return on investment. 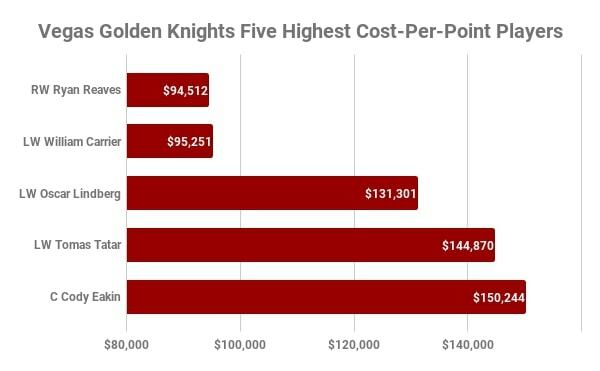 The Knights have paid $115,258 per point, the lowest price in the league and significantly lower than the league average. Vegas is cost-effective because players are outperforming their contracts, including William Karlsson, Jonathan Marchessault, and Colin Miller. All earn less than $25,000 per point with Marchessault earning $8,724 per point, the lowest rate in the league. Vegas rewarded Marchessault for his production by giving him a six-year extension worth $5 million per season. Also interesting, Miller is a defenseman and blueliners typically aren’t among a team’s best value. Even on good teams, defensemen are usually among the players with the highest CPP. 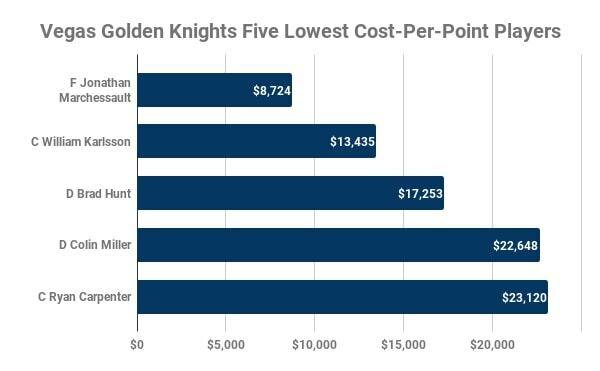 The Knights have two defensemen among their five lowest CPP rates, which illustrates how they constructed their blue line without an elite number one but by counting on all three pairs. Even the players with the highest CPP – Cody Eakin, Tomas Tatar, and Oscar Lindberg – aren’t bad compared to other teams. All three earn less than $151,000 per point while other teams pay multiple players more than $200,000 per point. 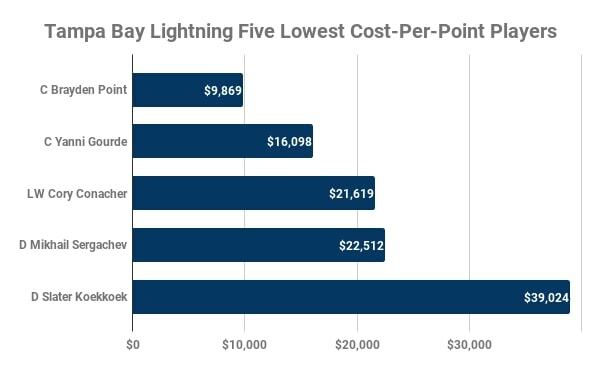 The Lightning are the second most cost-effective team due to an elite offense and players on team-friendly contracts. The team has two of the league’s top five scorers in Nikita Kucherov and Steven Stamkos. One of the biggest reasons for the Lightning’s low CPP is Kucherov playing on arguably the most team-friendly contract in the league. He will likely score 40 goals and eclipse 100 points while having a cap hit of less than $4.8 million. Another reason is Brayden Point who’s scored over 50 points while still on his ELC and Yanni Gourde posting 50 points with a $1 million cap hit on his bridge deal. In addition, the Bolts have more underpaid players than overpaid. Steven Stamkos and J.T. Miller are both paid below market value based on their production levels. 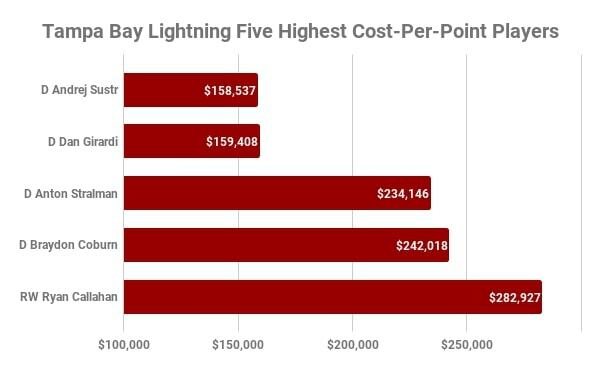 Only Ryan Callahan is absurdly overpaid and four of the Lightning’s five highest CPP are defensemen; a team can live with that given the effect they have besides scoring goals. Of the 10 teams paying the lowest CPP, all but three are in a playoff position, and those three – Colorado Avalanche, New York Islanders, and Carolina Hurricanes – are still in contention. Of the seven playoff teams, six are near locks to make the postseason and only the San Jose Sharks have less than a five-point cushion on a playoff spot. Of these 10 teams, there are different methods to achieving a low CPP. The Nashville Predators, Boston Bruins, Islanders, Penguins, and Lightning all have high payrolls, potent offenses, and are getting production from cheap contracts. At the other end are the Winnipeg Jets, Avalanche, Hurricanes, Sharks, and Golden Knights. The Jets, Golden Knights, Sharks, and Avalanche are great offensive teams with low team caps. Meanwhile, the Hurricanes have the second smallest payroll in the league, don’t score a lot of goals, and some of their best players are still on ELCs. The Jets, Avalanche, Hurricanes, and Lightning are also among the 10 youngest teams in the league. 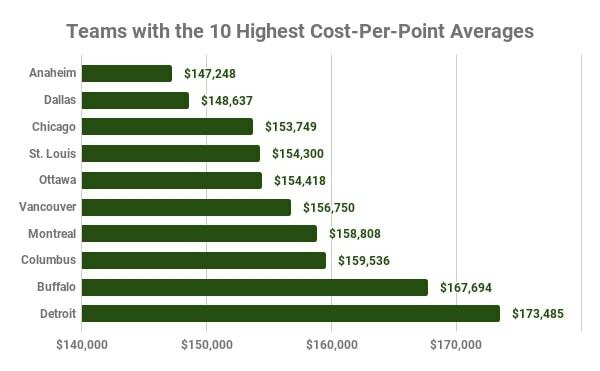 If the Golden Knights and the Lightning are among the best teams with the brightest futures and are paying the least per point, the teams paying the most will not be surprising. 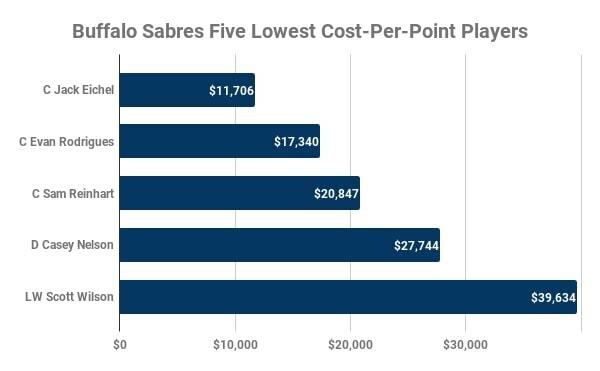 The Detroit Red Wings and the Buffalo Sabres are among the 10 worst teams in the league and are paying the most per point. While there are several ways of achieving a low CPP, there is only one way to achieve a high CPP: not scoring goals. Even with a low payroll, a team that doesn’t score will still pay a high CPP. The Red Wings have the highest CPP this season at $173,485. 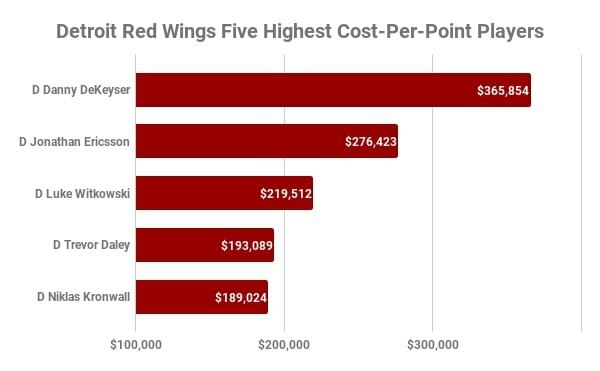 They have three players who earn at least $200,000 per point, including Danny DeKeyser at $365,854. In total, the Red Wings have 12 players earning at least $100,000 per point and of those 12, 8 are at least 30 years old. This falls in line with the fact that they are the oldest team in the league. The five players with the highest CPP are defensemen, which is common. Niklas Kronwall has the highest point total of those on the list with 19, 12th highest on the team. Danny DeKeyser, meanwhile, has just eight points in 48 games, which ranks sixth on the roster among defensemen despite having the second highest cap hit at the position. Despite the Red Wings’ high CPP, they do have valuable players. Dylan Larkin has the lowest CPP on the team and is also Detroit’s leading scorer with 48 points, but is getting almost no help. Larkin’s high value is also because he is on his ELC. Of Detroit’s five lowest CPP players, three are still on their ELCs – Larkin, Anthony Mantha, and Tyler Bertuzzi. The remaining two, Martin Frk and Andreas Athanasiou, are on their second contracts and are still young and cheap. Larkin, Mantha, and Athanasiou are also among Detroit’s top five point producers this season. The Sabres are at the opposite end of the age spectrum with the seventh-youngest roster. They are, however, the lowest scoring offense in the league with five players on their roster with at least 30 points. The team has the second-highest CPP because of Zach Bogosian and Josh Gorges, defensemen who have had injury issues this season, with Gorges playing 28 games and Bogosian playing 18 and will miss the rest of the season. 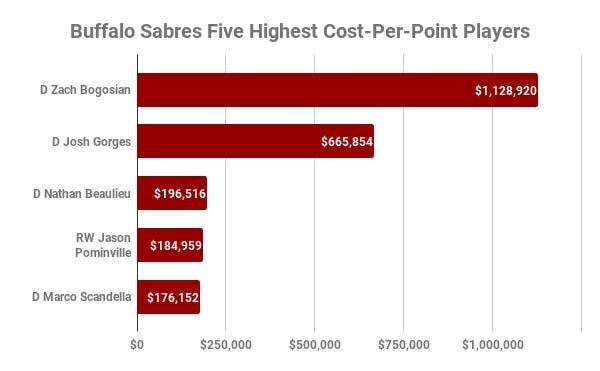 Bogosian has one point, a cost of over $1 million per point on the season and Gorges has two, a cost of over $500,000 per point. 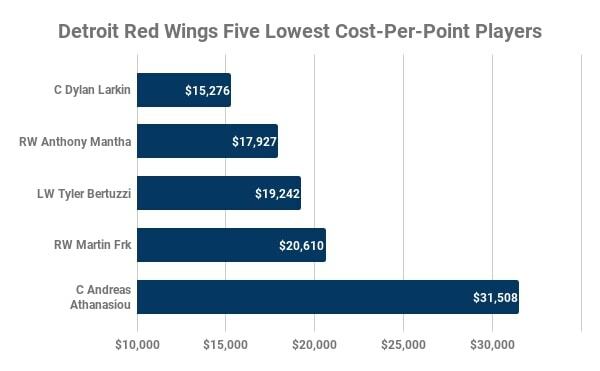 The remaining players in the top five are paid less than $200,000 per point, showing how badly Bogosian and Gorges skew the data. The Sabres do have young players with upside and they appear in the team’s five lowest CPP. Unsurprisingly, Buffalo’s best player, Jack Eichel, leads this group. Eichel is still on his ELC and leads the team with 53 points in 55 games. His value will change next season when he starts his new deal that has a $10 million cap hit. The rest of this group consists of players 25 or younger and with cap hits of less than $1 million. Sam Reinhart and Evan Rodrigues are also in Buffalo’s top 10 in scoring. Of the 10 teams paying the most per point, only the Anaheim Ducks, Columbus Blue Jackets, and Dallas Stars are in a playoff position. The St. Louis Blues are the only other team in the hunt for a playoff spot. Seven of the teams are among the 10 lowest scoring teams in the league. The charts and information above note a team’s CPP as of Mar. 4. Those rates are continuously changing as players contribute offensively. In the same way that winning cycles exist in hockey, I feel confident that there will be cycles in measuring team CPP over a large enough sample size. The Chicago Blackhawks rank third-worst in CPP this season, spending $153,749 per point. During the 2014-15 season, when they won the Stanley Cup, they spent $114,632 per point. The salary cap has risen from $69 million to $75 million since then but that is still a significant increase in CPP. The decrease in value also makes sense as Patrick Kane, Jonathan Toews, and Brent Seabrook all had massive extensions kick in since that season. Similarly, as the Penguins age, Tampa Bay makes major roster decisions, and Carolina’s young players move out of their ELCs, these teams are unlikely to remain among the most cost-effective teams. A front office can make all the right decisions with draft picks, trades, and signings yet will still face the ageing curve which affects every successful team in a salary cap league. Teams handcuff themselves by signing their core players to extensions, deals that have to be done. It happened with the Los Angeles Kings, the Blackhawks, and will eventually happen to the Penguins. Extending core players often affects a team’s ability to surround that core with cheap, quality talent. With less supplemental talent on the roster, the team relies more on the core and, as that core ages, the team slowly becomes less competitive and get less value from their players. On the bright side, contracts eventually expire or the salary cap increases and more money is freed up to spend elsewhere. It is that ebb-and-flow that interests me in future seasons. I want to see how the best and worst teams by CPP switch places with the natural development of players and how the front offices allocate money. *All stats come from Hockey-Reference and all salary information comes from THW’s team salary cap pages.